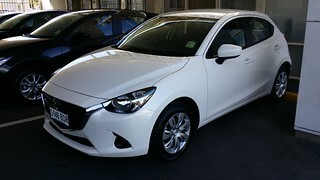 We got our first deliveries today of the all new Mazda 2 hatch, which will be offered here in 3 trim levels, Neo, Maxx and Genki. There's also the Maxx Colour, which see's the seat trim and other bits of trims within the car, in the colour red. There is also a Mazda 2 sedan that 'll be released next year, which is due in Australia around the middle of 2015. Taken here at our Mazda dealership.